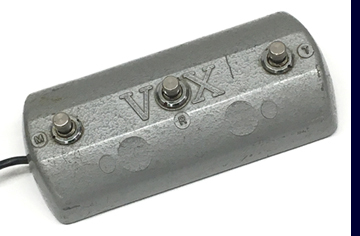 Vox Egg Pedal - Sand cast aluminum single button footpedal with Vox logo. This is the style of the original foot switch designed to control the Vibravox effect on AC-15 and AC-30 amplifiers. This pedal has a 15 foot cable terminated with a 1/4" plug. Exact replacement for the AC30TB and AC30TBX but may also be fitted to vintage Vox amplifiers. 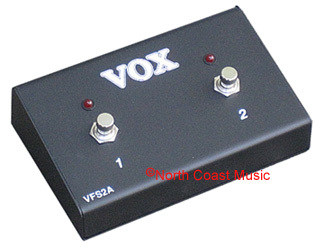 The Vox Egg Pedal is also a functional replacement for the now discontinued Vox VF001 foot switch. 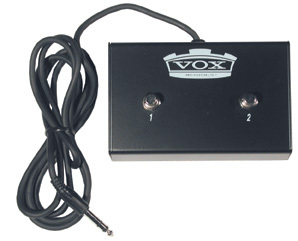 Vox Egg Pedal With Six-Pin DIN Plug - Sand cast aluminum single button footpedal with Vox logo. This version of the "Egg" pedal is equipped with a six-pin DIN plug and was used to actuate the distortion effect on solid state Vox Dynamic Bass, Vox Foundation Bass and Vox Super Foundation Bass amps. The latching switch is wired to pins 4 and 5 of the DIN jack, per the JMI factory schematic. 12 foot cable. 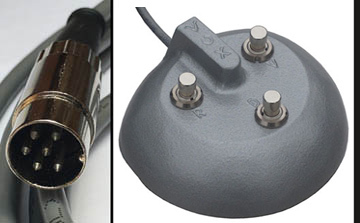 Please check before ordering that your amp has a six pin, not a five pin foot switch jack (see photo at left). While some Vox amps were equipped with a five pin jack, we can only supply this foot pedal with the six pin plug. 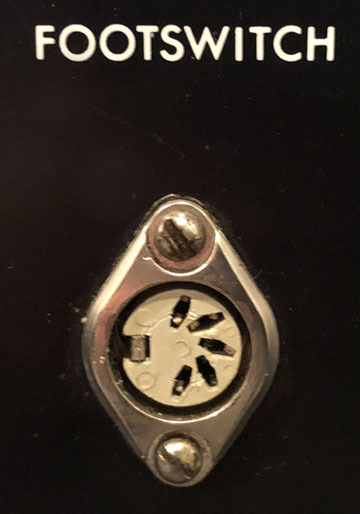 The six pin foot switch plug is incompatible with the smaller five pin recepticle. Original Thomas Vox foot switch, used and about fifty years old. Tested and fully functional, remotely controls Reverb, Tremolo and MRB. 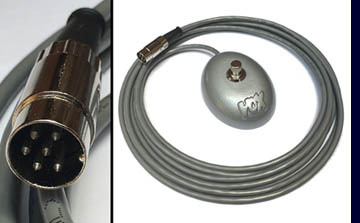 Original cable and six pin DIN connector. Original gray "hammertone" paint finish with some minor scuffing as one would expect from a pedal this old. Original steel base plate with ribbed rubber tread.